At the Geneva Motor Show, TopGear grabbed a few moments with the chief of Mercedes Benz large car division, Dr Uwe Ernstberger, who confirmed that while an electric S-Class isn't really a correct fit for now, "a complete electric car will be done in the future." But, it sounds like Mercedes Benz are a bit behind on battery technology "We have to work on the capacities of the batteries to get a better package in the car," Dr Ernstberger said. 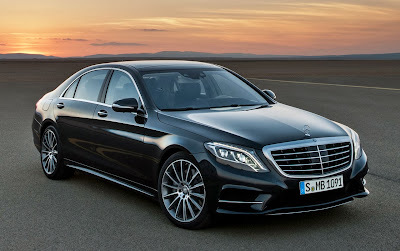 "Because you do not want to lose all the comfort features of an S-Class for transporting a battery only. "First of all we'll have the plug-in hybrid, where you can drive between 25km to 30km on electric power only. We want to use a battery to support electric driving in a closed city like London, and we use the combustion engine for driving outside the city." So it looks like Mercedes will join BMW, who are considering a 5 series EV, in working on a large battery only luxury sedan to compete with the Tesla Model S while Audi go after Tesla's Model X with their own 600 km range battery only luxury Q8 e-tron SUV. There seems little doubt the German auto industry recognise a serious competitor when they see one!